Several weeks ago, it was officially announced that the film ‘The Mahabharatha’ would be made based on veteran Malayalam writer M.T.Vasudevan Nair’s ‘Randamoozham’. The story has been narrated from the perspective of Bheema the second among the five Pandavas and hence Mohanlal will be playing the character of Bheema in the film. It was also announced that the film will see the participation of many pan Indian actors and technicians. Now it is almost confirmed that Tollywood star Nagarjuna who has also acted in popular Tamil and Hindi films will be playing the role of Karna in ‘The Mahabharatha’, which will be directed by popular Ad Filmmaker V.A.Shrikumar Menon. Akkineni Nagarjuna is presently busy with the promotions of his latest production ‘Rarandoi Veduka Chuddam’ starring Naga Chaitanya. 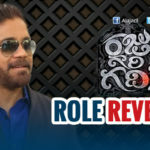 During the promotional interviews, Nag revealed that he has been approached for Karna character by the filmmakers. He said that he is also interested to play the Karna character. He also said that director Srikumar is working for the past four years on this script. Well, few other big names like Kamal Hasan, Amitabh Bachchan are also being heard to be part of the cast of this huge film. Can we know confirm that Nagarjuna is a part of the movie or should we wait for the official announcement from producers like the actor said himself?